Bart Blatstein bought the Showboat in 2015 and operated it as a non-gaming resort in the four years since. The New Jersey Casino Control Commission meets on Monday to decide whether to extend a permit to apply for a casino license to Bart Blatstein, the owner of the property where the Showboat Casino once existed. If Blatstein, a Philadelphia real estate developer, secures a gaming license, it would be a first step to him securing a full-fledged casino license in the coming months and years. Previously, the Division of Gaming Enforcement (DGE) recommended that the Casino Control Commission issue a casino license to Blatstein. The DGE vetted Blatstein’s career before making the pronouncement. Bart Blatstein submitted a casino license application in February 2018, which led to the issuance of a statement of compliance by the DGE. Blatstein purchased the Showboat property from Caesars Entertainment for $23 million in January 2016. In June 2016, he re-opened the Showbat as a non-gaming hotel. In October 2018, Bart Blatstein asked for the Casino Reinvestment Development Authority (CRDA) to convert 264 rooms in the Showboat hotel into market-rate rental apartments. In November, the CDRA approved the request. Those rentals apartments are expected to go on the market in the summer of 2019. The Showboat closed for business as a casino in late-August 2014, when Caesars Entertainment Corporation chose to close one of its four operating casinos in Atlantic City. Though the Showboat was one of a handful of AC casinos which remained profitable throughout the global recession, Caesars decided it was the best operation to shut down. At the time, Showboat’s workers protested the closure, but to no avail. 2014 was the low point for Atlantic City’s casino industry, as four casinos (Atlantic Club, Trump Plaza, Revel Casino) closed within a single calendar year. Trump Plaza, Revel, and Showboat closed with a few week’s time of one another. A fifth casino, Trump Taj Mahal, underwent a bankruptcy the same year and nearly closed, but was saved in December 2016 when top shareholder Carl Icahn gave the casino a $20 million influx of cash. Trump Taj Mahal closed in October 2016 in the midst of labor strife. The loss of so many casinos was catastrophic for Atlantic City’s economy, jobs market, and finances at the time. The closure of four casinos in a year led not only to a loss of 8,000 jobs from the casino sector, but also led to a dramatic drop in property taxes. With so many neighboring buildings closed, property taxes on the remaining casinos plummeted. The various closures meant Atlantic City had only seven operating casinos by the spring of 2018. With less competition, those seven casino operations became profitable, so the period from 2015 to 2018 represented a slow-but-steady recovery for the casino industry, if not Atlantic City’s economy and finances. On June 28, 2018, two separate casinos — Hard Rock Atlantic City and Ocean Resort Casino — re-opened for business. Many gaming experts and financial analysts wondered aloud whether the Atlantic City casino market could sustain two more casinos. Some of those doubts still persist. Ocean Resort Casino, located in the Revel Building, continues to struggle financially as the first-year anniversary of its grand opening approaches. Hard Rock Atlantic City, re-opened on the site of Trump Taj Mahal after a $500 million renovation project, appears to be on much more solid financial ground. Hard Rock International is owned by the Seminole Tribe of Florida, which has a casino table games monopoly in the State of Florida. Bart Blatstein has a reputation in the casino industry due to his role in the Philadelphia Live! project. At a time, Bart Blatstein was whispered to have considered buying the Revel Casino briefly, but Glenn Straub bought the ill-fated casino in a bankruptcy auction for roughly 5% of the cost of building the skyscraper. Mr. Blatstein gained considerable goodwill by re-opening the Showboat as a non-gaming resort. 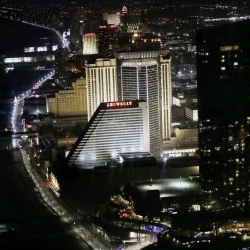 Not only did the business’s operations give residents jobs and the city government additional tax revenues, but it meant the property values of the other seven Atlantic City casinos would increase — and thus providing an indirect boost to AC casino tax revenues.